It's been raining every morning, which is really weird as the monsoon season was officially over more than a month ago. Boris is taking it philosophically. He spends the morning all relaxed on the sofa. Here he is. Doesn't he look happy? Look at that Cheshire cat grin! I'm planning a summer holiday in Madrid where my mum lives. I'm picking up my brother from the Middle East on the way, and we're planning to have lots of fun. So when I Skype my brother the other day, we have this conversation. Me: I'll be getting an international driver's license for the trip. Bro: E, you're not driving. Me: Is it because we drive on the other side? If so, illegal parking by the condo people has turned our 2 way road into one way, and I've been driving on the other side for the last 6 months. Me: Is it because I forgot about pedestrian crossings last time? Hey, we've got one now in the industrial park now. I stop, even when the other cars are beeping for me to drive over people. Bro: That's good. But no. Me: Is it because I tried to bribe that guardia civil that one time? That was just a reflex action, and he forgave me when he realised why. Bro: Hey, I'd forgotten about that! Me: I don't drive in the emergency lane, I always indicate, and I don't drive the wrong way up a one way street to save myself a few hundred meters driving around. Bro: I know. But you're still not driving here. Me: You'll get bored driving me about. I've given in, but I'm getting my revenge. I shall have wine with every meal, and he can drive! Dis is de 707th post so I am writing it. It's too impawtunt to leave to de survunt. She already forgot about de 700th post. I told her, "Dis is bekos you are hanging owt all de time with dat fur brain Target." she just smiled. fur brain! for Chinese kats, 7 sounds like to go up which is furry good. it also means together in Chinese. Yes, 7 is a furry good number. Furry prosperus and also ospishus ospicious lucky. To celebrate i am showing you a piktshur of me. I am hiding in de reecycle newspaper pile. yes, i am a covurt kitty. Clevur and handsome, dat's me! I'm not showing piktshurs of Target or Boris bekos today is all abowt me. You can send me gifts if you like. Ham is good. Or rost chikkun. 7 slices of 7 birds. now dat would be lucky! The best thing in our house at the moment: the sight of Au eating. Although he's still thin, Au is looking a lot better - I think. What do you think? Before we start, Miss KC is sick. 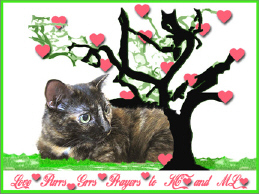 You will know her as the tortie who keeps The Cat Blogosphere up and running ~ with the occasional help from her thumbed assistant, ML. Please purr for her, and her mum. 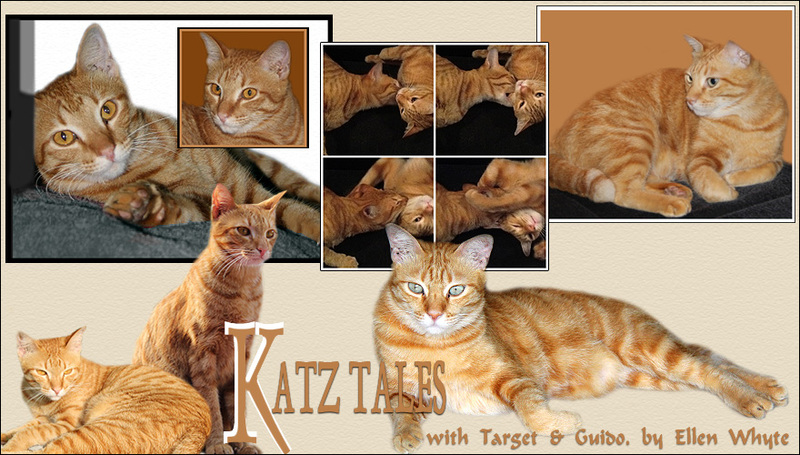 You can visit them at their blog MissyBlueEyes. Au's word is BOSS. No doubt about it. 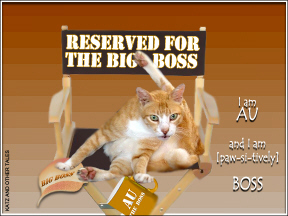 Au has all of us firmly under his paw. This morning he got me up at 515AM for breakfast, and again at 545AM - and he did it by sitting up in bed and sending brain waves. I waken up, see his silhouette, stumble out of bed, and am serving him food pillow-side before you can say, "mind games." Target is as soft as butter, as sweet as sugar, and as soft as silk. He purrs all day long, and when he sees us after a huge 5 minute absence, he collapses in a furry puddle and rolls over to show us his tummy. We call this his Victory Roll. 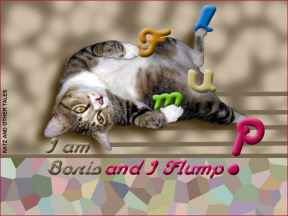 Boris' word is definitely FLUMP. Boris has 3 pleasures in life: eating, playing, and sleeping. An ex-stray who has wormed his way into our home and hearts, Boris eats 5 or 6 square meals a day, and sleeps on the sofa for a full hour after each chow-down. When he wakens up, he runs through the house like a mad thing, and then collapses at our feet to play Bite The Hand. Although he's huge, Boris keeps his claws in, and plays with velvet paws. I really enjoyed this and hope you did too. I've got a big commission in so have to postpone visiting till tomorrow. Meow until then! Au is 13 years old. Target is 3 years old. Boris is somewhere between 3 and 5 years old, we think. Au was born in Malacca. Target was born in Subang Jaya. We don’t know about Boris, but we found him in Subang Jaya. 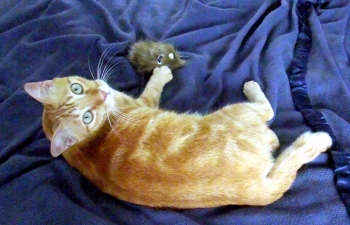 When Au was a baby cat he was wrapped up in plastic bags, thrown out of a car, rescued and handed over to us. Target was rescued from a storm drain after his family died. We adopted him 3 months later. Boris pitched up in our street about 9 months ago, and moved in with us. 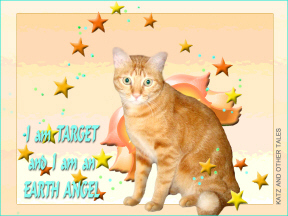 Target is Mr Snizzles, Mr Kitten, and Sweetie-Pie-Angel-Darling. Boris is usually Boris and also sometimes Fat Cat. Target likes roast lamb, roast chicken and dental treats. Boris likes everything except dental treats. Au does classic kitty curls. Boris sticks all four paws in the air. Au prefers the bottom of the bed and the big chair. Target shares my pillow and hogs a corner of the sofa. Boris hogs the other end of Target’s sofa. Lots of people already have this award, but we found some we think haven't yet: Marianne, CatSynth, 10 Lies 2nd Chances, Catsparella, Herman, Chronicles of Woos, and Khyra. The rules are to link back to the giver (us! ), tell us 7 things about yourself, and pass it along to 7 others. As for the news: Au continues to eat! he's napping in bed now having had two small breakfasts of crunchies and fish. See you Monday! 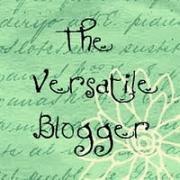 This post was written Monday afternoon and was set to be put up after midnight but Blogger has gone nuts! I can't edit this or change it. Sorry Gattina! Au is in bed, relaxing after his 2nd breakfast. He continues to eat well, so we're happy. He is sleeping a lot which isn't unusual but he is sleeping heavily which we think means he's healing. He's taking RetroMAD1 twice a day, and it seems to be doing him good. At night he plays with his newspapers and demands that we play a wild game with him too. We are extra careful with the wild games as we don't want him to become over-tired. Target is dividing his time between his pal and the office. 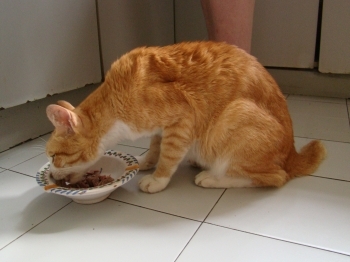 He is also hoovering up all the cat food that we bought to tempt Au. We think his stripes are spreading further apart. The picture is of Au tucking into some roast pork. He's still dreadfully scrawny but isn't he looking better? As you can imagine, we're over the moon. See you Thursday for an update.